In 2024 Elon Musk will fly the first humans to Mars. 4 years later, in 2028, the United Nations target to reach gender parity. At Impactpool, we are convinced that achieving gender parity is not rocket science; it is a piece of cake compared to travelling to Mars. Reaching gender parity is not a problem in itself, it is the lack of sincere willingness and commitment to the goal that creates a problem. We believe the main obstacle is found in internal culture, resistance to change, strong incentives to preserve status quo and lame ambitions and willingness to really achieve the goal. Impactpool is the world's fastest growing social career site and we take gender parity seriously. One area where women in all time has been hindered or faced challenges to advance a career is tech. With this campaign we are determined to change that pattern. We have lined up the most credible organizations in the world and together we invite you to join our women in tech pool. You join the pool and organizations will be able to find you when there is a match and need. Established in 1960 and headquartered in Brussels, EUROCONTROL is an intergovernmental organisation with 41 Member States and two Special Agreement States. As a technical organisation, we are committed to building, together with our partners, a Single European Sky which will deliver the air traffic management (ATM) performance required for the twenty-first century and beyond. Our staff complement is made up of over 1,900 highly qualified professionals, spread over four sites (Brussels, Maastricht, Brétigny and Luxembourg), deploying their expertise to address ATM challenges. Airspace management and organisation: We work with the European Commission, Member States and the aviation community to develop an improved route network over Europe’s busy skies, so that flights can get to their destinations more directly, thereby saving time, fuel and money. 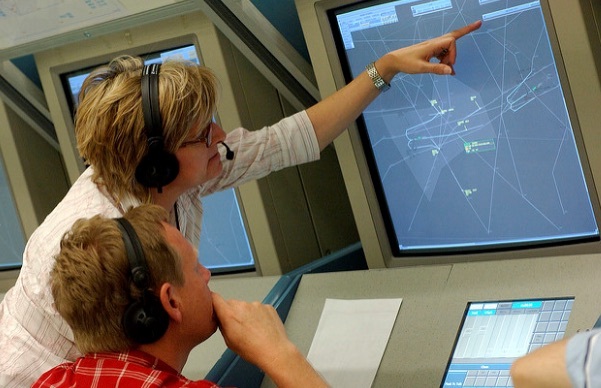 Air traffic control: Our Maastricht Upper Area Control Centre provides safe, cost-effective air traffic services in the upper airspace above 24,500 feet over Benelux and north-west Germany, controlling some 1.8 million flights a year in some of the world's most dense and complex airspace. 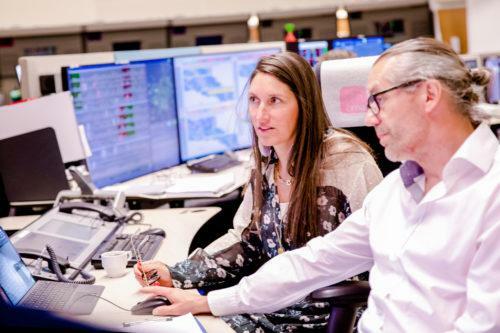 Air traffic flow and capacity management: Through the EUROCONTROL Network Manager, we aim to balance airspace capacity with demand, optimising the efficiency and safety of air traffic for the continent’s busy skies. Aeronautical information management: An efficient air transport system requires accurate, timely and tailored aeronautical information. We ensure that aeronautical information is provided in a global and interoperable way, while building a network-centric information system for Europe. Civil-military ATM coordination: We facilitate civil-military coordination and cooperation in European air traffic management. We also help States and stakeholders implement the Single European Sky (SES) and the SESAR Programme with the goal of optimising the sharing of airspace. 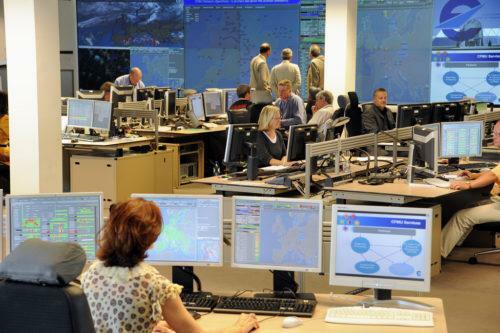 Communications, navigation and surveillance: We are working on the air traffic management infrastructure of the future, to ensure a fluid exchange of information between airspace users, and to provide a harmonised and integrated common framework for the European air navigation system. Environmental impact of aviation: We put our environmental expertise at the service of our Member States, the European Union, the International Civil Aviation Organization (ICAO) and the wider aviation community to help measure, monitor and mitigate the impact of aviation on the environment. Economics and business cases: By developing business cases and cost-benefit analyses, we provide valuable economic analysis tools for airspace users, air navigation service providers, airports, military users and major aviation decision-makers. Human performance in ATM: We analyse the various elements which can influence people’s ability to complete tasks successfully. Our main goal is to align organisational objectives with human needs to build an effective, efficient and safe air traffic management system. Safety: With our safety management activities, we support pan-European air navigation service providers in their efforts to keep air-traffic-management-induced incidents to a minimum, while ensuring that safety enhancements are in line with European regulations. Simulations: We offer a full set of simulation platforms covering all phases of flight, from en-route air traffic control to TMA, including airports, the EUROCONTROL Network Management function, and even the cockpit side. Training: We deliver quality training in air traffic management to a variety of actors in the aviation community. A wide range of training services and products is delivered, from general introductory courses on air traffic management concepts to advanced operational training. Organisations need to be in tune with changes in society if they are to thrive and succeed. Nowadays, the social and business benefits of a gender-balanced diverse and inclusive workplace are not contested, but with the female percentage of the workforce at EUROCONTROL comprising only 27%, we know we still have a long way to go. We in the aviation sector recognise the need for change and have started to send out a number of strong signals. In our field, a key driver of change was the roll-out of a EUROCONTROL Diversity & Inclusion Policy, focusing initially on gender diversity. We sponsor, take part in and fully support related initiatives initiated by our partners and stakeholders. We subscribe to the launching by the European Commission of the Women in Transport – EU Platform for Change and signed the EU Declaration on equal opportunities for women and men in the transport sector. We also support ICAO’s efforts to achieve gender equality in the aviation sector. The Platform for Change initiative also enables stakeholders to make their individual endeavours more widely known and to share their good practices. Read the full article here. Listen to four of the women working at EUROCONTROL in air traffic management and have the opportunity to chat with them. An HR representative will share information on what makes an application successful, conditions, benefits etc. 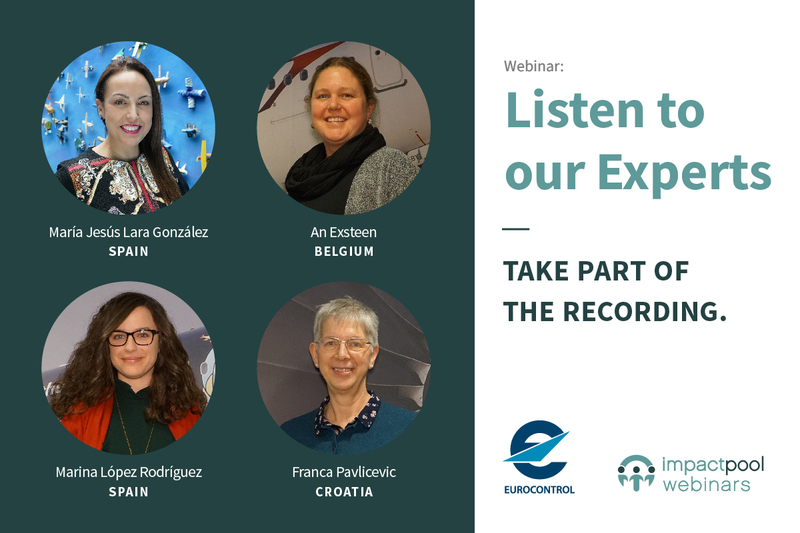 Before you join these women in the EUROCONTROL webinar, here’s a chance to find out more about what they do and their backgrounds. 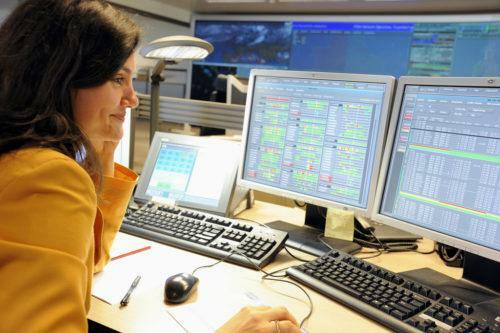 Learn more about EUROCONTROL and apply for your dream job! Are you a woman in tech? Join the largest pool making a difference in this expertise. Need support in transitioning into the impact sector?